In the heart of picturesque Mount Dandenong (only 45 min from Melbourne CBD), on a 10-acre property, is a luxury romantic hideaway, one of Mt Dandenong's best kept secrets. A home away from home, four poster bed, open fire, indulgent spa, full kitchen with a Continental breakfast hamper included for the first 2 days of your stay. While staying in this gorgeous B&B you will experience the beauty of the Dandenong Ranges flora and fauna as Merrow is nestled among giant mountain ashes, centenary tree ferns, colourful camellias and rhododendrons, hydrangeas, magnolias... Merrow Cottages is superbly located, close to all restaurants , 1km from Olinda where you can find a bottle shop, a bakery, a supermarket and other restaurants, we are 3 min from the Cuckoo restaurant & lovely shops. We are only 10min from Sky high/Observatory. Close to most wedding venues. Perfect for honeymoons! More accommodation on site if you would like to prepare for your wedding nearby. 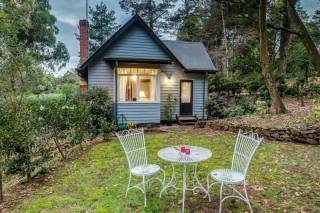 In the heart of picturesque Mount Dandenong (only 45 min from Melbourne CBD), on a 10-acre property, is a luxury romantic hideaway, one of Mt Dandenong's best kept secrets. A home away from home, four poster bed, open fire, indulgent spa, full kitchen with a Continental breakfast hamper included for the first 2 days of your stay. Merrow Cottages is superbly located, close to all restaurants , 1km from Olinda where you can find a bottle shop, a bakery, a supermarket and other restaurants, we are 3 min from the Cuckoo restaurant & lovely shops. We are only 10min from Sky high/Observatory. Close to most wedding venues. Perfect for honeymoons! More accommodation on site if you would like to prepare for your wedding nearby.